During winter time everyone’s that hasn’t seen or experienced what summer is about around the Greater Toronto Area has heard things like … Wait until summer comes, everything is green, OMG summer is perfect, not like winter, you have to wait until summer and all the food and festivals you can find around the city, and so on. Now, something that I’m dying to attend is the Pan American Food and Music Festival, which is a multicultural event where the cultures of the 41 Pan American countries are reunited showcasing their traditions, tastes, dances, music and more. Food trucks, food vendors, culinary events that are something to taste and appreciate. As I’ve been researching this is not just a festival to grab and eat. The Pan American Food and Music Festival brings a higher culinary level to those looking for a palate upgrade. Is a Free event that will be held and Yonge – Dundas Square during 25 and 26 of August, there is also a VIP opening reception and I will do my best to get in. The Panam Food Fest brings chefs from all the region and this year there are showcasing Ecuador. Also in this year all the chef presenting during the food competitions, other of its many highlights are that all of their 20 chefs presenting are women’s!. I think this is the first time in a culinary event I’ve heard about it. The Festival has Caliente y Picante, which literally translates to hot and Spicy. Chefs will compete and present their dishes at the Food competitions tent. If you like hot and spicy Latin food, this is the place. Also, Sea Food fantasia is a competition to join in, because seafood tastes even better during summer, maybe accompanying it with a beer? 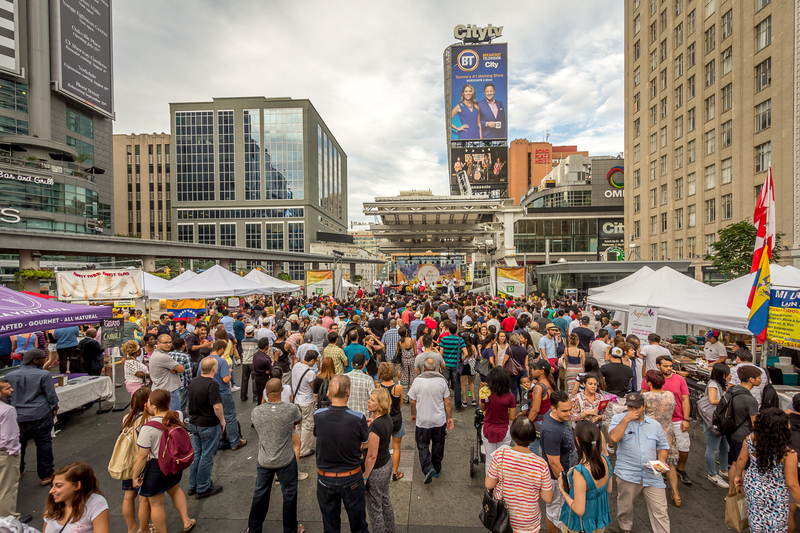 And talking about beer, this year the Panam Fest is bringing a Beer Garden right on Yonge-Dundas square, can you believe it? Because is a 2-day event, there are additional things to do. Like the Arepa Contest, heard about those contest of who eats more hot dogs? Well, this one is about who eats more Arepas. A dish from Venezuela and Colombia. Is cooked maize dough in a pan or fried, either way, taste great, besides is gluten-free, so Vegans welcome. It has a round form, think like it a sort of rounded shape sandwich. You can put in everything on it, from a salad to any kinds of meat, or an egg, just butter or simple cheese. There is a registration to join this contest, contact the event management on Facebook for inquires. Music is the additional half of the Festival. From Salsa to Merengue, Bachata, Cumbia, Capoeira, Joropo, you name it. All Pan American rhythms from 11 am to 11 pm on Saturday 25th and from 11 am to 8 pm on Sunday. So if you like to eat, dance and know about all the traditions and folklore of the Pan American countries this is a must to do in this summer in Toronto.